Phuket International Airport is your entryway into the decadent heart of Thailand. Expansions of the airport have increased its annual passengers from 6.5 million to 15 million, making it the third-busiest airport in the country. As a gateway to Phuket Island, a popular resort destination, Phuket International Airport plays a major role in the country’s tourism industry. Phuket International Airport (IATA code: HKT) is a major hub for both domestic arrivals and departures and international arrivals and departures. Flights to Phuket International Airport are provided by international airlines such as Qatar Airways, Etihad Airways, and Emirates. HKT is a 50-minute drive from Phuket City and a 60-minute drive from Patong. Book your cheap flights to and from Phuket International Airport online! Built during the 1970s, when Patong was a rustic Thai village that was only accessible by boat or jungle trekking, Phuket International Airport has come a long way since its humble beginnings. Today it is the gateway to the Kingdom of Thailand and the third-busiest airport in the country. The airport comprises of a 3,000-metre-long runway and two terminals: one for international flights and one for domestic flights. Recent expansions have seen a third terminal added for charter flights and the annual passengers soar from 6.5 million to a record-breaking 15 million in 2016. Flights to Phuket International Airport are wildly popular thanks to Thailand’s status as the ultimate beach holiday destination. With eateries ranging from coffee shops and bakeries to fast food joints and restaurants, and an array of shops and services, Phuket International Airport is a utopia for waiting travellers. Shops at Phuket International Airport include convenience stores, souvenir boutiques, bookshops, fashion and accessories, toy stores, florists, tobacconist, wine shop, and duty-free shops. Services at Phuket International Airport include foreign exchange, car hire, first aid, information desk, pharmacy, photo services, baggage, airport shuttle bus, and a massage parlour. Duty-free shopping is available in the departures area. Please be aware of baggage restrictions and duty-free allowances at your destination. Coral Executive Lounge in the International Terminal is open to passengers waiting for international departures from Terminal 1. It is open from 6 a.m. to 12 a.m. and offers a number of premium amenities such as spa services and showers. Coral Executive Lounge in the Domestic Terminal is open to passengers waiting for domestic departures. It is open from 6 a.m. to 12 a.m. and offers a number of amenities. Coral Executive Lounge in the International Terminal is open to international arrivals. It is open from 6 a.m. to 12 a.m. and offers amenities such as air conditioning and televisions. Phuket International Airport offers a number of facilities, including: ATMs, post office, prayer rooms for Muslim passengers, disabled access, telephones, and a smoking room. This comfortable 3-star hotel is conveniently located a few steps from the airport and in close proximity to the beach. Some of the amenities include a 24-hour front desk, air conditioning, laundry service, luggage storage, daily housekeeping, breakfast, and free airport shuttle bus. Complimentary Wi-Fi and parking is also available. This family-friendly 4-star hotel is situated just 5 minutes from Phuket International Airport. Some of its amenities include a swimming pool, room service, fitness centre, 24-hour front desk, housekeeping, laundry service, meeting rooms, luggage storage, and a garden. Wi-Fi and parking is complimentary. This 5-star hotel and spa offers luxurious accommodation just a few steps from the beach. The hotel is fully equipped with a full-service spa, swimming pool, fitness centre, business centre, airport shuttle bus, garden, restaurant and bar, air conditioning, and in-room childcare. Free Wi-Fi, parking, and breakfast is also available. Foreign exchange can be ordered online up to 60 days before departure from South Africa. There are four currency exchange counters in the arrivals hall and one in the departures hall at Phuket International Airport. The multi-storey parking facility at Phuket International Airport offers parking for drop-offs, short-term stays, long-term stays, women drivers, and disabled drivers. Pre-booking a long-term parking bay will get you a significant discount on parking rates. 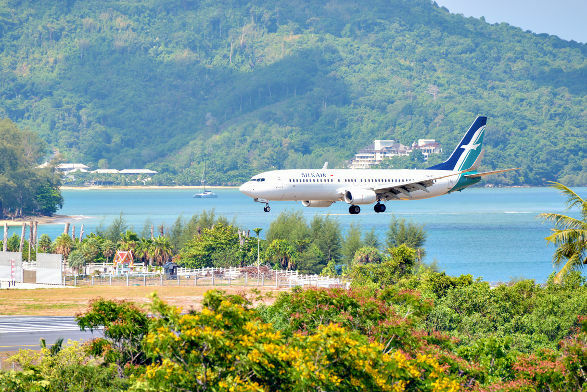 Phuket International Airport is located near Mai Khao beach in the Thalang District, approximately 35 km northwest of the Phuket city centre and 38 km north of Patong. A number of transport options are available to get you from the airport to your destination. These include: Car hire, public van, airport shuttle bus, metered taxi, and limousine.